free time, where art thou? I'm still here, with just a minute to spare. I've been busy making beads like there is no tomorrow. I was way behind on filling orders, there were just too many. A good problem to have, but it has been causing some missed sleep! In between the beads, I've been working on my assignment for the NY conference next week. I'm taking a part 2 class with Tomie. : ) Jack and the Beanstalk was our homework. I'll post some of them after the conference. I'm so excited about going, I can't even tell you. I'm looking forward to hanging out with the PBJ's! Plus, I just happen to love New York and can't wait to visit the city again. It melts my brain. Now I'm going to go try to find a zzz's. Happy Creating! Art Biz Blog's topics on websites & blog marketing. CraftMemo for keeping track of your materials, inventory and projects. I haven't used it, but it looks interesting. Luann Udell's always informative blog has tips on getting started in your arts & crafts business. It has 18 in the series, here is #18, you can find the first one on the right-hand side and work your way up or start at #18 and work your down. My website has put away the holiday finery and has been simplified and refined for beads only. Look for updates on Monday with some new beads and auctions. 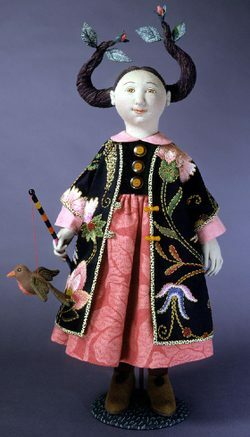 More doll inspiration. This one comes from Linda Wingerter. Who happens to be a successful children's book illustrator. The name of this piece is Cinderalla Makes Do. 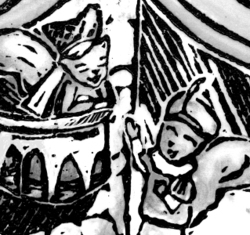 I love the narrative quality of the doll and that has my own wheels spinning. I'm in the middle of cleaning out and rearranging my studio. (My mom inspired me!) Hoping that somehow that will help productivity. I didn't like the set up before and ended up doing most of my illustration work at our dining room table. I'm in the middle of the process and it's a bit scary. Wish me luck! Oh, was taking better care of yourself one of your new year's resolutions? Or maybe feeding your creativity? Check out Linda Dessau's free resources. Be good to yourself this week! Here is my latest attempt. I tried something a little different and painted her entire face with my oil paint/liquid polymer mix. I then sanded it and painted on her facial features. It gives the clay a more organic feel. I thought the other two looked a little too plastic for my earthy tastes. I have grand plans for this one. I'm going to bead a little bird's nest hat for her. Yes, I have gone off the deep end. But I like the water! Her lovely striped stocking feet. 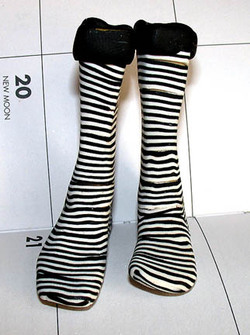 I created these by overlaying a striped cane on the sculpted feet. I like socks - much easier than toes! Now for some hands/arms to match and she'll be ready for assembly. I'm going to do her body in an embroidered silk that I've been using for pillows! My sewing skills are very limited. I managed to whip up a kimono style top and very full skirt with an elastic waist, along with a little scarf that I crocheted. I'd like to knit a wool sweater, make some tiny shoes and she needs something woodsy. Maybe I'll make a little acorn purse. I did give her a haircut, a bit more sassy. Now for names, it took me nine months to pick out my daughter's names. Anyone have a suggestion? Now I need to get back to work, making the ol' beads! 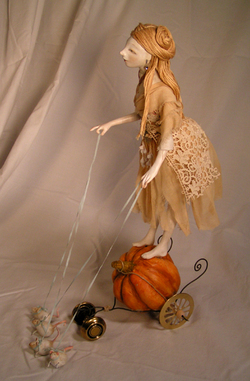 Hmm, dolls can be two things...utterly enchanting or horrifyingly creepy. Hopefully I can create ones that fall into the first category. My creative process goes in 4 stages: inspiration, gathering, interpreting and creating. The inspiration is that first seed of an idea. It might come from something that I see, read or something buried in my subconscious. Gathering is my favorite step of the process. I read, look at other artists work, find my materials and stay open to the possibilities. Interpreting is taking all the information, that first seed of the idea and my materials and deciding how to create something that is my own vision and voice. Whether it's beads, illustration or a craft, I have to find a way to make it something other than a copy of what others have done, I have to interpret the ideas through my own visual language. This stage often includes prototypes and experiments. The final step is creating the actual pieces that I will call my artwork. Of course, by the time I get to the final step, I usually have made another discover or had an idea that pushes me even further and the process starts over again. "Waiting for a Prince II" by Marlaine Verheist. 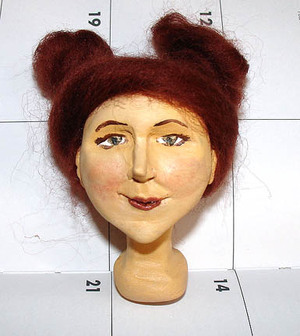 A pressed wool felt doll by Maggie Iacono. How are these even made? Such a beautiful mystery! Here is what my heart has been set on for the month of December, dolls! Why? I have no idea. 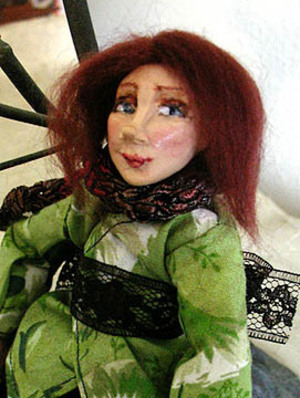 I am not a frou-frou type person, I've never been a doll person. I guess it started last month when I was searching for an alternative to American Girl Dolls. Because I could not justify paying $90 for a toy for my daughters. 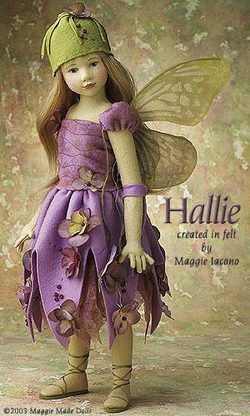 So that led me to this site, which led me to Magic Attic Dolls. My mom and I bought two, Heather & Megan for my girls. I have had so much fun making clothes for them, I can't even begin to tell you. 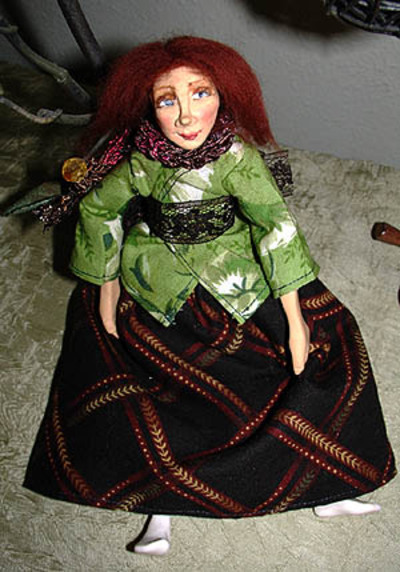 I kept seeing the name Sasha turn up when I was looking at the Magic Attic Dolls and not being a doll person, I had no idea. 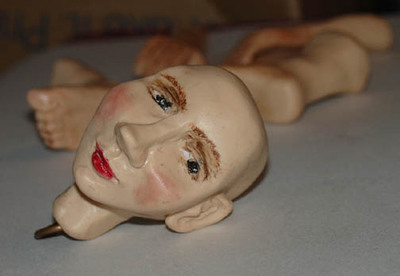 So now I'm smitten with Sasha dolls, but can not even fathom paying that much money for a doll for myself. Someone very generous is going to have to gift me one, because I can't justify paying $150 when I have real children to feed and clothe. Rats. And I have no interest in any other type of doll on the market. There is just something about the Sasha's that appeal to my long forgotten inner-child. 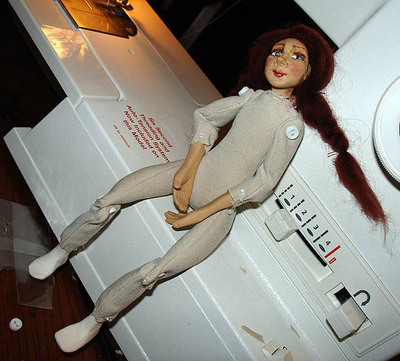 So Saturday I got up and had the idea that I would try my hand at making dolls. 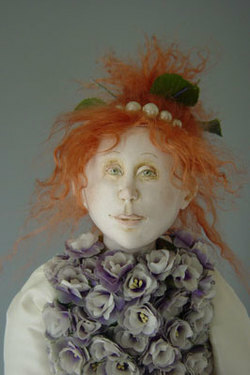 After all, polymer clay has it's roots in doll-making and I am a polymer clay artist. I have never sculpted anything before and had no idea what I has doing. It took a few failed attempts, a few hints on some websites later and the girl above appeared in my hands. Oh my, I love it. I want to make more and more and more. I have no idea why or how they will turn out, but I am just going to follow my muse and see where she takes me. If nothing else, it makes me happy! 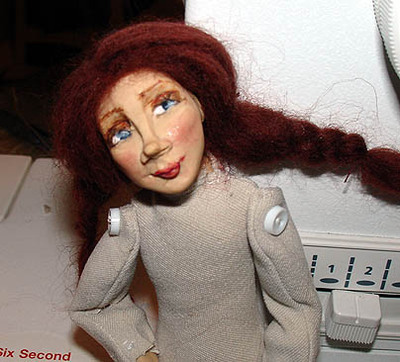 The one above will be a button-jointed doll with a fabric body, her feet and hands are polymer clay. I need to figure out hair for her. I have wool roving and need to experiment. I'll show the results when she is finished. Happy Creating! Happy New Year! I hope it's filled with promise and exciting adventures. I have a new notebook for all my great ideas this coming year and a new day planner that will be filled with some fun days looming in the near future. I even picked up a few storage boxes for my art supplies, as I need to get my studio organized. No goals or resolutions this year. I like Roz's themes. So if I had to pick one, it's Play. I'm going to spend more time playing around this year. With the little tangents that my heart desires, such as dolls, to playing more with my girls, (H. wants to learn how to play kick-ball) to playing and having fun with my artwork. Life is so short and there are far too many people worrying about the grown-up stuff, I think I'll spend 2007 indulging my inner child. I hope you do too!